Whether you’re selling your home on your own or with an agent, here are some ways to ensure getting an average of $10,000 more in your purchase price. ***I put a 6th one in there for those who are going to use an agent as you can only get this to happen with a Realtor. 1. DECLUTTER – One of the easiest ways is to Declutter your home. I tell every seller that I work with to put things away, box them up and make it look like a model home as much as you possibly can. Knick knacks, tchotchkes, and anything of the sort….put them away. Also, if you have a lot of pictures or wall art, make it more minimal and clean. 2. PERSONAL ITEMS/RELIGIOUS ITEMS – It goes hand-in-hand with the above one, yet this goes a step further. Put away or box up personal photos and items that include your family. Also, religious items as well. I know that can be a touchy subject yet you’re moving anyway and will need to box these items up no matter what, so why not start now. As stated above, make your home look like a model home. 3. PAINT & CLEAN DOORS/BASEBOARDS – The best item you can purchase when getting your home ready to sell is a Mr. Clean Magic Eraser. This 1 item can work wonders on your walls, doors, door jams and baseboards. Then whatever you need to touch up with paint, you can do that. And a little trick…if you don’t have paint you can remove a light or outlet cover and chip a piece of the wall from there to get a “paint chip” and bring that to a paint or hardware store such as Home Depot, Lowes, Sherwin Williams and they should be able to match it for you. 4. LANDSCAPING/PRESSURE WASHING – Pulling weeds, cutting back foliage (trees, bushes, shrubs) and fresh mulch can make a huge impact, especially since you want that initial “WOW” factor and creating nice curb appeal. If you have a pressure washer, or rent one, cleaning up the driveway, walk way and exterior walls of the home can make a huge difference in making it gleam getting you more money in turn for your home. 5. AMBIANCE – Open blinds, turn on all lights, put soft music on and put some “Plug-ins”, scented candle or diffuser on. The “feel” of your home is what can sell it. Everyone who’s looking to purchase a home goes off of how they feel when they enter the home and the vibe it gives them. The more you cater to this, the more buyers will want to make an offer making your buyer pool much larger which can also net you more money as you could potentially get multiple offers on your home. 6. ***This one is if you hire a Top Agent in your area. HIRE THE RIGHT AGENT – There are many things to look for in a Realtor that will get you top dollar for your home. One of which is their marketing plan. 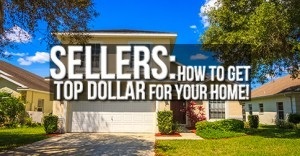 If they market and expose your home to a lot of buyers, you have a better chance of getting more money for your home. On average, a seasoned agent will net you between $5,000-10,000 more than a newer agent. Another factor is giving you the right price when listing your home and showing up to the appraisal with the right information. This can be HUGE and kill a deal quickly if you don’t have the right agent handling your sale. Presented by Jillian Von Ohlen with Keller Williams Realty and The Von Ohlen Team. 772-214-8530 or jillian@vonohlenteam.com.